Signs of methadone addiction include lying to doctors, hiding methadone use, or developing an emotional attachment to methadone. More signs and symptoms of methadone addiction here. How can you recognize when you or someone dear to you is addicted to methadone? There could be behavioral changes or physical changes. Because methadone addictive properties are based in the way methadone acts in the brain, these changes can be both noticeable and covert. More on the signs and symptoms of methadone addiction here, and when to seek treatment for them. Plus, a section at the end for your questions about finding methadone addiction help or how doctors treat methadone addiction. Has someone close to you been prescribed methadone? Methadone is one of the most commonly prescribed drugs used to treat addiction to hard opiates (often referred to as methadone maintenance treatment). It is also used to manage severe chronic pain, much like morphine is. Some people may also misguidedly use methadone for recreational purposes. Whichever the case, methadone itself can be addictive and the difference between the correct dose and a habit forming addiction can be difficult to distinguish. The addict may take methadone more frequently than prescribed by the doctor or may increase dosage without doctor’s supervision or knowledge. Hiding methadone use is another strong warning sign. The addict may also lie to their doctor or exaggerate their symptoms to get higher dosages prescribed. A methadone addict may possess illegal methadone brought from.street vendors rather than under a prescription filled by a pharmacist. The person may develop a tolerance to methadone and may need more of the drug to get the desired effect. The addict develops an emotional attachment to their drug – there is a physical dependency as well as a psychological need to get more and more of the drug. They may also show other addictive behaviors such as alcohol abuse and the use of other banned substances. The person could appear out of sorts, confused drowsy, stressed and may have mood swings. You may also notice changes in appetite, weight and sleep patterns and physical coordination. Nausea, vomiting, diarrhea or constipation can be present during methadone withdrawal, dosing, or addiction. A sign of methadone addiction may include complaints of headaches, dizziness, dry mouth, itchiness and rashes. The addict will typically be evasive and may deny dependence upon the drug. If the person’s breathing seems slower or their heart rate becomes irregular and blood pressure falls, treat this as a medical emergency and get them to a medical facility at once. The Diagnostic and Statistical Manual of Mental Disorders (DSM) describes certain criteria for mental disorders including addictions. The criteria for substance abuse are met if a person’s methadone use disrupts their normal functioning at school, work or in the home, if there is recurrent substance use and if there are legal issues, social and interpersonal problems. Addiction is defined by the person’s social and personal life suffering significantly as a result of substance abuse because of time and resources spent trying to acquire the drug, because of tolerance, withdrawal and an inability to control use in spite of recognizing the problems that it creates. Methadone addiction symptoms: Can they be treated? The good news is that methadone addiction can be treated using a combination of pharmacological and behavioral therapy approaches. It may not be easy, but an inpatient residential facility or an outpatient clinic can help an addict recover and once again become a functional and productive member of society. 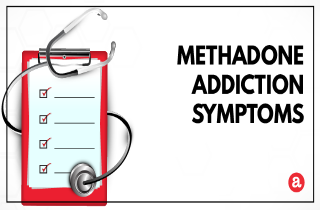 There are two main steps for helping and addict address methadone addiction symptoms. First, planning an intervention. Second, getting them into appropriate treatment. 1. Intervene and present the problem. The first step to getting help for methadone addiction is to confront the addict and get agreement to treat the problem. As someone close to the addict, you can orchestrate an intervention for the sake of your loved one who may not recognize that they need help, who may be in denial of their situation or may simply be unwilling to get the help they need. Call on people who you know care about this person and who you know are important to the addict; whose opinions matter. They could include family members, close friends, a religious or spiritual leader from the community and perhaps close colleagues. Prepare beforehand by listing specific instances and examples of how the addictive behavior is impacting not only the addict but others around. Get information about treatment options and create specific goals with guidelines to achieve them within a timeframe. Gather together and have a meeting to confront the addicted loved one and lay down these facts and also make clear the probable consequences of not getting help. 2. Learn about methadone addiction treatment options. When an addict is ready and willing to undergo addiction treatment, first the drug dosage is tapered off to minimize withdrawal symptoms. Underlying psychological issues will also be addressed to detect the root cause of the harmful addictive behaviors. Psychotherapy could encompass the teaching of coping mechanisms and stress management techniques, behavior and diet modifications and eliminating enabling behaviors and even pernicious relationships from an addict’s life. Next, you’ll need to choose either outpatient treatment or inpatient residential treatment for addiction. A residential inpatient treatment facility helpsmonitor all aspects of an addict’s behavior 24×7. Medications, one-on-on therapy, exercise, behavior and diet modification, group therapy may typically be a part of the program. This type of treatment may be more effective for someone who is deeply addicted. On the other hand, an outpatient clinic prescribes medication, monitors progress and may or may not offer therapy. The addict will remain part of society even as they undergo treatment. However, with an outpatient facility there are more chances of enablers and environments triggering harmful behaviors or a relapse so there may be a greater need for self control on part of the addict and more contributions needed from family and friends. Do you think someone you know could be abusing methadone? Do you believe that a loved one is addicted? If you have a loved one that you suspect is abusing methadone or if you have any questions with regard to their behavior write in to us. You can comment or ask a question in the comments section below. We shall respond to you personally and promptly. I have a nanny that has a mom who buys extra take home packs. I am starting to believe these people are just plain old awesome liars. How do I know for sure there is an addiction happening. There are several kids involved. She swears her mom takes them as percribed but I saw for my own eyes something about a take home pack and using someones urine. Can anyone explain to me how a methadone clinic works and some signs their is an addiction? I know someone that has been on methadone for many years following heroin abuse, they are weaning her from ten a day down now to three she is freaking out and hoards some of her doses so she can use them for a high, it scares me a little because she gets hostile complaing of pain..eg headache and restless leg and pops extra pills to get relief she says, but it appears to be a behavior that is not conducive to being free from the methadone, she dosnt want to get off from it, they are making her….how can I stay positive about her recovery when she is still fighting so hard to keep the drug.? I think my daughter my be on meth, she won’t go get rehab. Then, you may call the helpline you see on the website to talk with a trusted treatment consultant who can help you find a treatment program that fits your daughter’s needs.